Who Will Win Cruise International’s Best New Ship Award? You are at:Home»News»Industry News»Which Line Will Receive Cruise International’s Best New Ship Award? Which Line Will Receive Cruise International’s Best New Ship Award? Nominations for Cruise International Awards 2014 has officially closed. This means that the countdown is on to find out which line takes the crown for Best New Ship. There were some fantastic new vessels launched this year, setting new standards for luxury cruising. To get you excited for the big announcement, we’ve taken a look at some of the nominees and what’s on offer on-board. Passengers enjoy access to 28 dining venues, ranging from casual buffets to five star sit down meals. Five water slides are peppered across the decks while a three level sports complex offers the ultimate at sea workout. Entertainment is first rate, with passengers able to choose between experiencing the surreal magic of Illusionarium or the spectacular seven-time Tony Award nominated musical production, Legally Blonde. The ship cruises the warm waters of the tropics throughout the year, with seven day Caribbean cruises departing from Miami currently scheduled for the next few months. 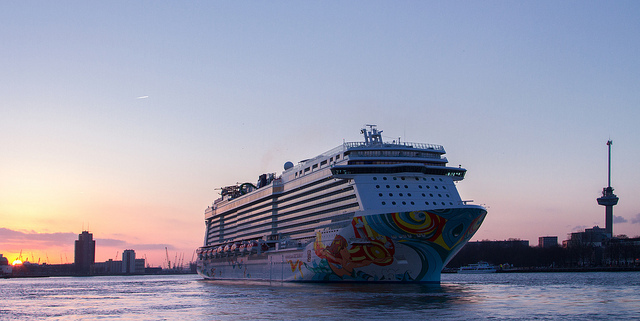 Norwegian Getaway already took out Bon Voyage magazine’s Best New Ship award so we’re thinking there’s a good chance this amazing vessel will be in for another shot at the crown! With a huge range of exciting new innovations, this Royal class ship is a strong contender for the Best New Ship award. At 141,000 tons in weight and 1083 feet in length, the vessel can carry a huge 3560 passengers. On-board, guests are treated to the most luxurious amenities the ocean has to offer. The famous Sanctuary spa, Movies Under the Stars and elevated glass SeaWalk all make an appearance while the line’s hallmark Piazza is grander and more elegant than ever. Dining options are extremely impressive, encompassing everything from gourmet Italian cuisine to casual hamburger and hotdog grills. Based in California, Uniworld operates 21 luxury river cruising vessels. SS Catherine is the latest addition to the fleet. The new vessel is boutique cruising at its best, the 443 foot liner oozing elegance and sophistication. Interior décor is a beautiful mix of old world glamour and contemporary class spread across four decks. Accommodation is suitably lavish, with all staterooms and suites featuring hand carved Savoir of England beds, flat screen TVs, marble bathrooms and L’Occitane en Provence bath and body products. With a passenger capacity of just 159 guests, the entire experience is wonderfully intimate. The opulent boutique vessel sails the Rhône and Saône while treating guests to free flowing champagne, personalised service and breath-taking river views. If you want to experience the cutting edge luxury of these three spectacular Best New Ship award nominees, head over to Cruise 1st for incredible deals on Norwegian, Princess and Uniworld cruises.